All Slots Casino has continued to expand its already impressive mobile platform with the introduction of two of Microgaming's newest HTML5 releases. The move sees the ever-popular Hitman video slot make the move to mobile for the first time, alongside new desktop game ‘High Society’. Microgaming have also revealed the sequel to the smash-hot Girls and Guns game, which will arrive on mobile at the same time as Hitman and High Society. The three games are sure to be of interest to fans of online betting, but just how good are the new releases from Microgaming. Hitman has quickly established itself as one of Microgaming's most popular video slots. Based on the “world's most dangerous assassin Agent 47”, Hitman is making its long-awaited move to mobile devices after gaining a large online audience. Consisting of 5 reels and 15 paylines, Hitman offers players a number of opportunities to scoop substantial wins with increasing wilds, as many as 18 free spins with doubled payouts. 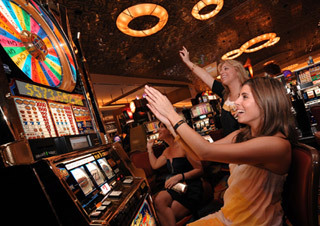 There is also an Insignia bonus which has the power to payout up to $6,000 and the Contract Bonus game featuring a top jackpot of a massive $270,000. High Society has been unveiled by Microgaming as an exciting brand new 5-reel, 25-payline video slot, with the game’s theme being the lifestyles of the rich and famous. Symbols consist of yachts, expensive watches, jewellery, private planes and the classic piles of cash to fit in with the game’s theme. The possible payouts available in High Society are befitting of the name, with up to 20 free spins and bonuses which are available to the player including Super Multiplier, Super Wild Reels and a top jackpot payout of an incredible $535,500. As well as the introduction of the two new games, All Slots Casino have also released the sequel to the popular Girls with Guns machine. For players using their desktop, the highly anticipated sequel to Girls with Guns - Jungle Heat has also been rolled out. Girls with Guns - Frozen Dawn is a 5-reel 243-ways to win game, with the theme of the game being a range of snow-capped mountains. Big winning opportunities are available to players with Frozen and Magnetic Wilds, with up to 12 free spins, and a maximum jackpot payout of 2,185,000 coins.